78 pages. Illustrated in color throughout. Hardcover. Published on the occasion of the exhibition Martin Kippenberger: Hand Painted Pictures at Skarstedt Gallery in New York, this catalogue features full plate images, details, and an extensive essay about the series by Art Historian Jakob Schillinger, Vorsprung Durch Reinkarnation. Painted in 1992, the series was created on the island of Syros, Greece and in the artist’s Frankfurt studio. 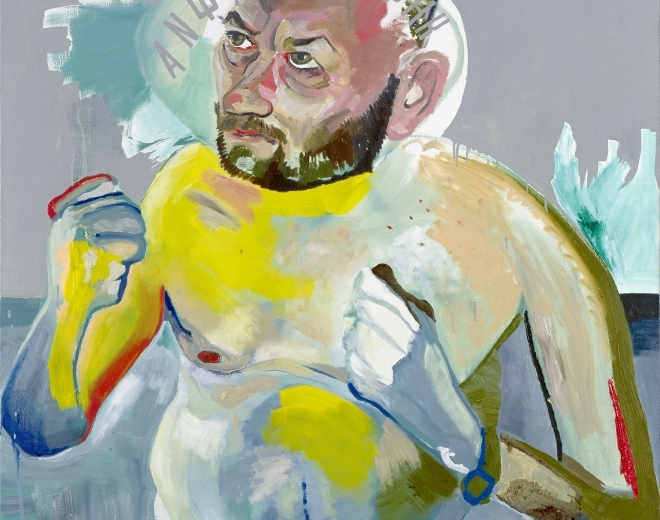 Hand Painted Pictures represents the second of three major cycles of self- portraits in Kippenberger’s oeuvre and demonstrates the artist’s preoccupation with the subject of self-representation. Classical art history celebrates portraiture as one of the highest genres of art for its ability to elevate the status of the sitter. Here, Martin Kippenberger scraps that institutional notion and instead offers an inglorious, sometimes grotesque, series of self-portraits. The paintings were first exhibited at Max Hetzler Gallery in Cologne, Germany in October of 1992. Often referencing modern icons and historical figures in his paintings, Kippenberger’s Hand Painted Pictures are at once comical and tragic, serious and subverted, and some of the most important paintings in his oeuvre.